The Body Politic: Our Prime Minister is not a Sheila and not a "Ranga"
Our Prime Minister is not a Sheila and not a "Ranga"
Our new Prime Minister is a person, and a female person - to boot. 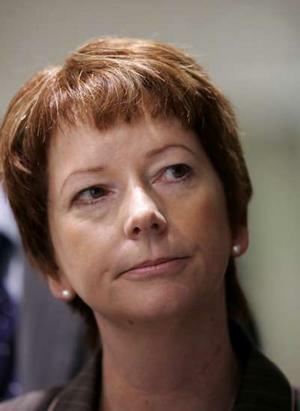 She ought not be characterised as a "sheila" and not as a "ranga". I will leave my original post there, so you can see how easily the average Aussie bloke can slip into silly errors. It was not meant to be offensive, and I apologise that it was. In Kevin Rudd's case, a day and a half was too long. Without support, he wilted in the sun, like a cut lettuce. He was not even prepared to call for a show of hands in Caucus. Some say this was to limit damage to the Party. Maybe. But it shows he was not made of the same stuff as Paul Keating was. I sent this message to my friend Leo, in Canada on Tuesday. This is the most imaginative Ad I have seen from the Liberals in ages. Kevin's election slogan nick-name in 2007 was "Kevin 07"
Shame it is "resonating with the public" because it might be quite effective in an election year. Don't be misled, however, the bastards behind this are still the same bastards they always were, under John Howard. But credit where credit is due - to the Advertising agency. Today I have had to update Leo with the new developments (the selection of Julia Gillard by the ALP caucus as Prime Minister). That "lemon" Ad I sent you has had a remarkable effect. It only ran for a few days, and guess what? The Labor Party back-room boys shat themselves. Amazing stuff. It remains to be seen if the strategy will work. CAUTION: LANGUAGE WARNING ON THE "URBAN DICTIONARY" LINK. For the Urban dictionary definition of "ranga" look here. It is amazingly frank. Be prepared to laugh a bit. Aussie humour at its best (worst). an unkind attack on her character by Senator Bill Heffernan. She is made of sterner stuff than Bill Heffernan counted upon. For a more restrained and balanced view of today's events (well, a self-professed feminist view, anyway) visit my friend Brigid's Blog "The Network". Well, I consider myself to have been rebuked (indirectly) by Brigid in her latest posting, objecting to the use of the term "ranga". When I met Brigid she did not appear to have red hair, and so I was not anticipating causing her offence. However, offence is obviously taken by not just her, but all (or any of) our red-haired colleagues. Someone ought start stereotyping us blond-haired, blue eyed, over-weight blokes - then I might know to be more careful with my wording..